Take the Guess Work out of Fertilizing. Depletion of nutrients in the soil can slow plant growth, inhibit flowering, or cause plants to become susceptible to pests and diseases. It’s important to ensure that your plants are receiving a proper diet of the three basic nutrients: nitrogen (which promotes leaf and stem growth), phosphorus (which promotes flower and fruit production), and potassium (which helps fight disease). Fertilize established plants using an all-purpose fertilizer in both spring and fall, with the exception of Hydrangeas and Azaleas. Fall plantings should be fertilized the following spring, and spring plantings should be fertilized 6 to 8 weeks after planting. Hydrangeas should be fertilized in early spring with an all-purpose fertilizer. Gardeners growing blue-flowering Hydrangeas, such as Nantucket Blue™ Hydrangea should use low-phosphorus fertilizer designed for acid loving plants. Additionally, organic items, such as coffee grounds, can be used to fertilize Hydrangeas and alter soil pH levels, producing deep blue blooms. Don’t fertilize after August. Azaleas growing in optimum acidic, nutrient-rich soil won't need much fertilizer. Applying organic compost or organic mulch is much more important. But if the leaves are turning yellow, we recommend having your soil tested. Azaleas in alkaline or nutrient-deficient soils need to be fed with a slow-release, acid-forming azalea fertilizer that contains iron and sulfur. Apply right after plants finish blooming in spring and again in midsummer at the rate specified on the label. Don’t fertilize after August. There are two main types of fertilizer: organic and synthetic. Organic fertilizers generally include compost or manure. They’re slower acting, but longer lasting. They also contain many other lesser nutrients that promote overall soil and plant health. Synthetic fertilizers include only the nutrients listed, generally nitrogen, phosphorus and potassium. They’re faster acting, but must be applied more often. Additionally, there are three main forms of fertilizer: granular, encapsulated and liquid. Granular fertilizers are slow-release, providing a steady supply of nutrients. They’re recommended for beds and containers. Encapsulated fertilizers are also slow-release and are recommended for container plantings. Liquid fertilizers offer quicker results than granular or encapsulated fertilizers; however, they usually need to be reapplied every few weeks. We recommend utilizing granular fertilizers on a regular basis and liquid fertilizers for plants in immediate need. We recommend only using organic fertilizers for edible plants. Also, various specialty fertilizers, such as that for citrus or roses, can be used for those plants at your discretion. Fertilizer should be applied around the roots of the plant. Roots generally extend 2 to 3 times wider than the branches. Ensure fertilizer is evenly spread. Too much fertilizer in one spot can damage roots. For new plantings, apply fertilizer lightly. For 1-gallon plants, apply 1 tablespoon of granular fertilizer around the roots of the plant. 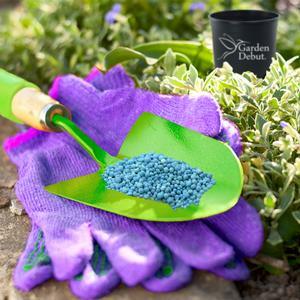 For larger plants, apply 2 to 3 tablespoons of granular fertilizer around the roots of the plant. For mature plants, apply fertilizer as directed by label. Be careful to avoid getting fertilizer on the foliage, as this can cause burning. Ensure to sweep up excess fertilizer on sidewalks or driveways to prevent it from being washed in to gutters, ditches or storm drains.